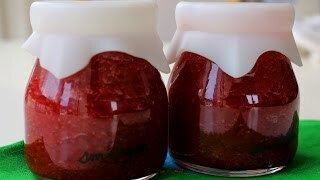 My strawberry jam recipe may be one of the easiest and simplest recipes I know! All you need is strawberries, sugar, and thick bottomed pot. When I lived in Korea, making strawberry jam was an annual event for me that took place every early summer, when strawberries were in peak season. I made a huge batch, enough to last one year. My friends and I would always go together to the wholesale farmer’s market where all the strawberries were sold in big shallow wooden boxes with no lids. This made it easy for us to see the strawberries we were buying and choose the ones we wanted. I always bought two kinds of strawberries: large strawberries and small strawberries. The large ones were expensive and my family and I ate them fresh or frozen them to make strawberry milkshakes. The small ones were cheap and perfect for making strawberry jam. Usually we would go in on some large boxes together to split the cost. Then we’d divide up what we bought and head home. The day we bought strawberries was a busy day for all of us. We parted at the market and each of us went home to hours of work washing, cleaning, and preparing our strawberries. Removing all the stems on small strawberries was tedious work, but I was always excited in anticipation of seeing my family enjoy what I made from them. This recipe makes a much smaller portion than what I used to make in Korea, and uses a lot less sugar. Strawberries are available all year round these days, so I don’t have to make a years’ worth at a time! In Korea I used a strawberry to sugar ratio of 2:1, or 12 pounds of strawberries with 6 pounds of sugar. I also boiled it longer to reduce it more. This recipe uses a different ratio: to make 1 cup of jam, it uses 1 pound of strawberries and ½ cup sugar. It’s meant to last in the fridge for up to one month, not for a full year. When you want some more, just make it again! It goes great with my bread rolls and fresh cold milk. Let me know if you make it, and tell me how it turns out! Combine the strawberries and sugar in a thick bottomed pot. Cover and boil it over medium heat for 12 to 15 minutes. Open and mash the strawberries with a potato masher or a wooden spoon in the pot. Lower the heat to medium low and let it sizzle for 30 minutes until it bubbly and turns shiny jelly but still runny. Stir and mash the strawberries from time to time to keep the jam from burning. Remove from the heat and let cool. Put it into a small glass jar. Serve with bread rolls or however else you like it. Posted on Wednesday, July 30th, 2014 at 9:38 pm. Last updated on October 6, 2014. Posted May 30th, 2016 at 8:38 am | Log in to reply. Maangchi, can malberrys be used instead of strawberrys and if not do you have a recipe to use them. Posted March 26th, 2016 at 4:58 pm | Log in to reply. Hello Maangchi! I tried your recipe and I liked a lot. My family LOVED IT a lot and they finished it in one day only. I will make jam again tomorrow with the bread rolls. I have mini jars so I can make enough jam for my friends at school. By the way I wrapped it with shiny ribbon stickers. Posted April 4th, 2016 at 4:17 pm | Log in to reply. I’m glad you like my strawberry jam recipe. It looks good! Posted March 24th, 2016 at 12:02 pm | Log in to reply. Confession: I couldn’t wait until the jam was done cooking before I took a taste. YUM! I immediately put some on the buns that I made from your site. YUMMY!!! Thank you so much for sharing. This must be the easiest recipe I have ever tried. I thought that jam making was so much harder than this. Posted March 23rd, 2016 at 7:50 pm | Log in to reply. I can’t wait to try Dinner Roll to try together. Posted March 25th, 2016 at 4:44 pm | Log in to reply. Your bright red strawberry jam looks very tasty! This recipe was originally posted on July 30, 2014 at 9:38 pm by Maangchi. It was last updated on October 6, 2014. The video was watched 500,734 times on YouTube & has 10,052 likes!